do you really need a litre bike? Since the dawn of time, well, since Gottfried Daimler bolted an engine to a bicycle, anyway, arguments have raged over the best size and layout to have in a sports bike. At the moment, looking on the world stage, it looks as though a V-twin is the best way to go for competition bikes. But on the road, four cylinder bikes dominate sales, partly through cost and partly through their sheer presence. So, layout aside, what's the best way to go? There are those who argue that there really is no substitute for cubes. Others will say that corner speed is king, and that a good lightweight will always win. While some go for the best of both worlds and try to get big power from a middleweight. We've had our share of heated discussions about this as well, so we've decided to sort it out. Once and for all. Preconceptions are a terrible thing. We all have them, of course, in spite of our best intentions. Look at us, for example. Three road testers of similar experience. 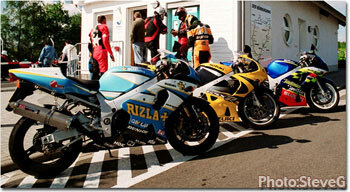 Adrian, having spent his hard-earned on an R1, believes that any sportsbike smaller than a litre is a mere pretender. Stuart, on the other hand, worships at the altar of agility and is thus the happy owner of a Triumph TT600. I, of course, am totally objective in this area as my own bike is a GSX-R 750. The fact that we have one with us on this test is, of course, entirely coincidental and will not influence my judgement in any way. So. Do you really need a litre bike? Can a 600 really be as quick as a 750, or indeed can a 750 live with a 1000? Age 44, riding since Mr Daimler did his engine thing. Fast, smooth and convinced of the merits of big powerful bikes over weedy fine handling ones. if you were able to utilise its full potential. Having ridden a 1000 sportsbike for more laps than I care to remember around the Nürburgring, my natural choice would have to be the GSXR 1000. It has the highest power and torque of any current superbike on today's market, so the only question was whether you could use it to it's best at the track, and would it handle the road style lumps and bumps of the Nurburgring under almost full power without spitting you off into the Armco? the merits of agility over power. I like 600s because they're plenty fast enough for real roads riding while remaining somehow more friendly than big bikes. He says, thinking fondly of his fairly recently departed Daytona 955... I've seen enough GSX-Rs to know that they're all pretty well sorted and usually far mroe capable than the rider. Just like now, really. The 1000 may well be just a little too much for an upright riding chap like me, the 750 belongs to Simon and I don't want to drop it so I'll probably end up happiest on the 600. So, um, that's my vote, then. At 38, only been riding for 24 years. Ex endurance and TT racer, as well as sometime Nürburgring instructor. Fast and usually smooth although has been known to get ragged. As a racer, swears by 750s as the perfect combination of power and agility. 600s are great, no doubt about it. The combination of light weight and reasonable power makes for a brilliant riding experience. Except when you're not totally committed, of course. At that point the lack of torque and the need to constantly stir the gearbox to keep any reasonable forward motion becomes a pain in the neck. Litre bikes certainly address that by throwing huge lumps of torque at the problem until it vanishes in a haze of burnt rubber. And that's the problem - a litre class sportsbike has so much oomph that it's almost unusable in many circumstances and pretty intimidating in most others. The 750 sits comfortably between both camps, with enough power to remove the need for constant gear swapping yet a gentle enough delivery to make lighting the back tyre up at least a little less likely. That's why I bought one - plenty fast enough when I want it to be yet easy going enough to use day to day as well. And that's why I reckon it will be the best bike around here as well. There's only one way that we can really decide this. Take the best sportsbike in each capacity group and ride them back to back. The fact that the best in each class happens to have the letters "GSX-R" in their names makes the test rather easier - all have brilliant handling and ace engines, and the shared gene-pool means that the playing field is as even as it can be to start with. Talking of playing field. This is not really a test we can do on the road. Apart from the fact that we could never guarantee consistent traffic conditions for long enough, getting an accurate idea of performance with bikes like these on public roads would result in the three of us being banged up before you could say "Journalistic integrity, Your Honour." So we came to the Nürburgring instead. Why the Nürburgring? Simple. 14½ miles. Anything between 64 and 170 bends, depending on how you count them. 1000 feet between the highest and lowest points. No speed limits, no traffic coming the other way. But still close enough to a normal road to be relevant for a test which is, after all, aimed at you, the road rider. So how are we going to do this? Quite straightforward, really. Each of us will go out and ride as many laps as we can on each of the bikes. We'll try to get speeds at certain points as well so that we can get an objective impression on just how easy it is to get the power down. After we've done that we'll sit down and score each bike out of 10 for confidence, handling, braking, performance and overall feel. There's no point in scoring for comfort or looks because they're so alike that they should all score the same. Then we'll average the scores and that should give us an overall winner.